While studying in Europe, Jose Rizal (center) was passionate about fencing, either practicing with fellow Filipinos or attending matches with his fraternity brothers, the Swabians. With Juan Luna (left) and Valentin Ventura. We are familiar with a picture of José Rizal fencing with Juan Luna and Mariano Ponce in Paris in 1883. The friends would go to the gym near Juan Luna’s studio on 65 Arago Street, and they would practice their thrusts. Well, in 1886, Rizal went to the University of Heidelberg’s Eye Clinic to specialize in Ophthalmology with the renowned German professor Dr. Otto Becker. While in Heidelberg, Rizal, the sociable and gregarious guy, fell in with a group of fraternity brothers, the Swabians. They wore yellow blazers and red caps. Student fraternities or corporations (Burschenschaften) were of great importance, and almost every other student was a member of these organizations. This student lifestyle became overblown mainly through the movie “The Student Prince,” which depicted carousing, dueling, womanizing and beer-drinking students in Heidelberg during Rizal’s time. Rizal joined his friends’ beer drinking sessions, and played chess with them at the corner Biergarten on Ludwigstrasse, a stone’s throw from Rizal’s apartment. Rizal’s newfound friends were enrolled in the law school. Thus, many on campus thought Rizal was a law student in Heidelberg. Fencing or “dueling” within the campus was verboten (prohibited). The administration believed it encouraged boisterousness and inclined to puff up the wrong bravado that attracted undesirables. Rizal’s dueling student cohort insisted it promoted integrity and discipline. Rizal sided with his fraternity friends, so they went regularly to a facility called Hirschgasse. It was across the Neckar River over the hills, a half-hour walk through Philosophen Weg, or else a ten-minute row boat ride on the river. Hirshgasse Hof (stag house) is where Rizal and his friends would go for duel bouts. In 1878, Mark Twain arrived in Heidelberg to stay overnight, but he ended up staying for two months, billeted at the Hirschgasse hof, then a hotel and restaurant. He described fencing in that facility. One of the requirements for the fraternities was to show courage, skill, honor, bravery and determination. This was done through “dueling.” The different fraternity organizations would form teams who would “duel” with each other at random. The protagonists were swathed in white protective bandages and gauze on shoulders, thighs, chest and arms. In addition, they wore a facemask of metal grill that protected the nose, mouth and eyes, but exposed a sheath of facial face especially on the cheekbone. Rizal, not being a formal fraternity member, could not directly participate in the “duels.” However he attended every match. "All for one, One for all" (in German) is the motto of Rizal's fraternity dueling cohort, The Swabians. Rizal’s cohorts displayed symbols of determination and bravery–scars on their cheeks--and took pride in their occasional torn tendons, nicked scalps and bandaged wounds. All in good sport. Rizal once noted they looked like “ghosts.” In today’s lingo, they looked more like zombies. Rizal would occasionally volunteer as an attending medical student. In fact, he developed great medical cosmetic skills in repairing skewed eyebrows, straightening displaced noses, uplifting sagging cheeks and propping up dislocated jaws. I was able to visit this site in October 2012. It is now a fancy restaurant, but the original dueling hall is still there. The wall decorations are old vintage photos of 1886. Of special interest are the wood tables so characteristic of student life--full of graffiti knife carvings, no space is spared! 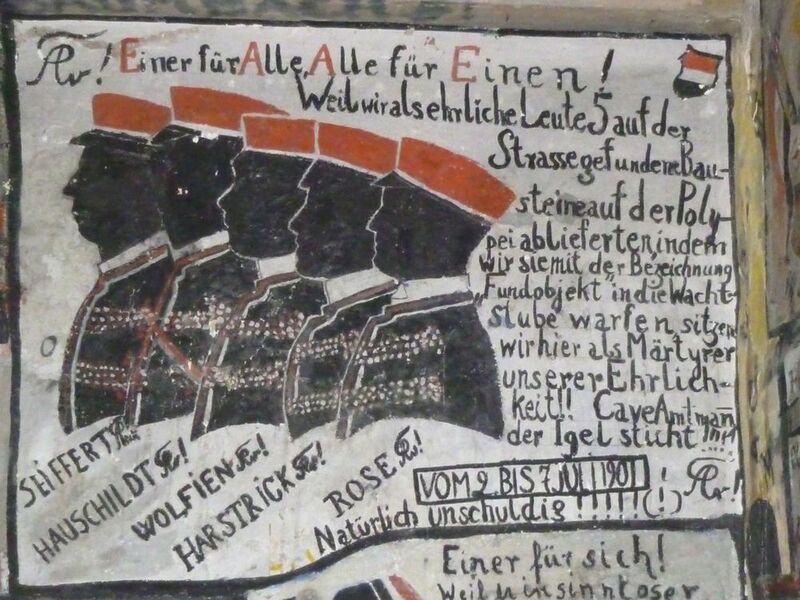 What struck me was that the Prince of Prussia, Bismarck, carved his name here while he was a student at Heidelberg and where he participated in the duels. 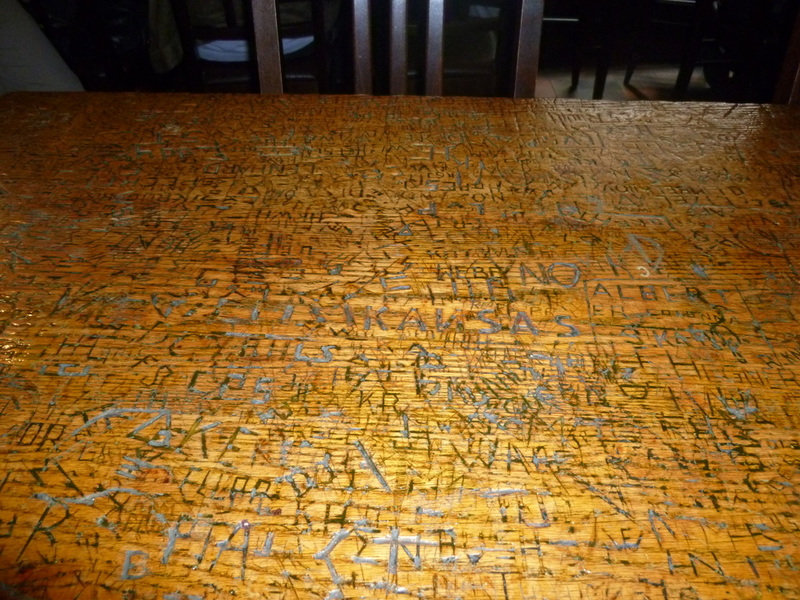 Students carved their names on the wooden tables at the Heidelberg restaurant, except for Rizal, although he often ate there. Unfortunately, Rizal never carried his pocketknife to Hirschgasse. What a great opportunity missed! We could be venerating his graffiti there today. Penélope V. Flores, Ph.D. is a Professor of Education Emeritus at San Francisco State University. 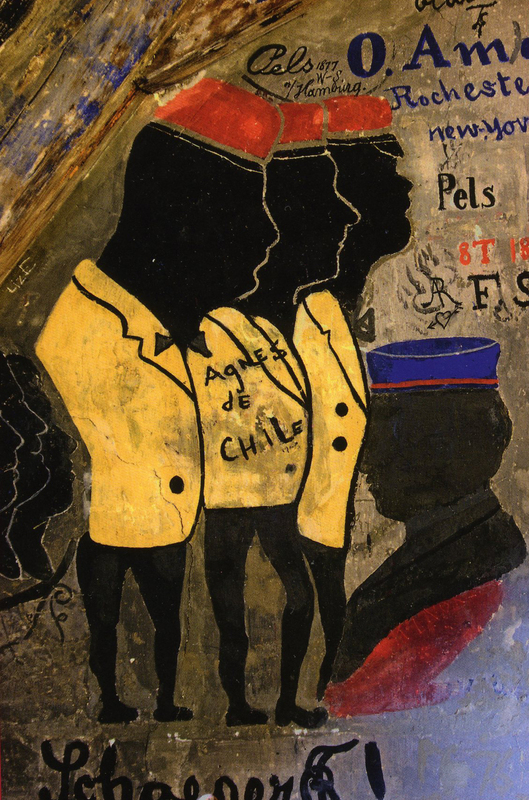 Her main interest is in "tracing the footsteps of Jose Rizal in Europe." She is building a Rizaliana library in San Francisco where scholars and researchers can have free access to her collection. Visit Penelope’s blog on Rizal at penelopevflores.blogspot.com.